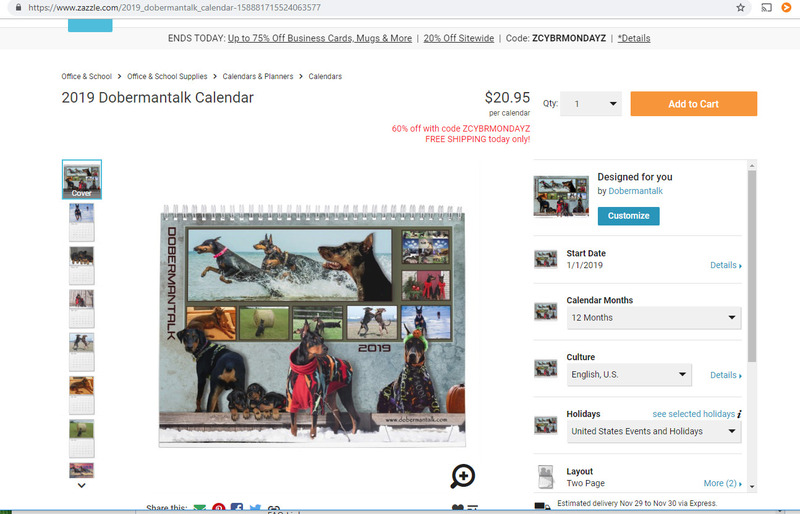 2019 Dobermantalk Calendar, For Sale Now! Sorry for posting the calendar a little later than we normally do, but here it is! Thank you for all of the entries each month and congratulations again to the winners. Last edited by greenkouki; 11-28-2018 at 08:16 AM. It's lovely this year (as always). And it's fun to see puppers from our community in calendar shape. Thanks! I got the 60% off - nice deal! I have a question -- I measured last years calendar - from top to bottom it is 17 inch's X 11inch's wide ! I then read about the 8/12 x 11 - are this years calendars smaller ?? Awesome deal & LDi did an awesome Rain Bow Bridge collage, for November. I hate to Bother you all - but - I tried to set up a account using my e-mail - and it says invalid e-mail - its the one I always use , any advise ? How is everybody ordering these ? I was able to use paypal to pay for mine, but yes you do need to make an account (annoying). You can just type any valid email and make up a password and it should work. Maybe try making the account before going to your cart and checking out. Got mine ...ordered with my pay pal account.......did have to set up an account first using email address then made up a password....once I set up account through the calendar vendor......pay pal went through fine. Thanks too everybody that helped put this together ! Thanks so much greenkouki! I get to see my Indy one last time in the DT calendar. I like that they went back to the old format and today there is a coupon code for 50% off: CYBRWEEKZAZZ. You still pay shipping but a good deal. Also, the design for November is just beautiful to honor all of our dear Dobes that have gone to the bridge. Thank you LadyDi! Last edited by eegreen; 11-27-2018 at 07:54 PM. Thanks again to everybody that worked on this project ! Thank you so much for the effort it took putting this amazing keepsake together this year. Your welcome from all of us! Finally got our calendars today Looks great ! Nice job everybody that worked on this project ! LD... You spell no better than Larry (beau), ECIN(Kenny..Doc) and I do!